The Latvian State Centenary programme is designed to be an open framework for social participation. Private citizens, organisations, and entrepreneurs are encouraged to invest their energies in creating a stronger Latvia in the century to come. The invitation to create events to dedicated to the Centenary has been well received, and over the course of the year the number of events in the celebration programme has doubled. Social involvement has exceeded original predictions. Many events dedicated to the Centenary have already taken place at the local, national, and international levels. Around 800 initiatives were planned at the end of 2016, at the moment, however, more than 2000 events have been registered and the number is growing daily. More than 500 Centenary projects have received financial support from the State Culture Capital Foundation’s target programmes, the State Regional Development Agency, through contests organised by the Latvian Environmental Protection Fund, and regional NGOs, and municipal and business funds. Entrepreneurs play a significant role in the Centenary celebrations. An official ‘participating business’ sign is available free of charge. In 2017, 200 entrepreneurs registered as ‘participating business’ in the Centenary celebrations, but the number more than doubled in the first four months of this year. Now 450 businesses are using the Centenary symbol in their communication materials and on new products. ‘The Latvian State Centenary programme is an investment in the people of Latvia and in its future. The results show that we have reached the goals set for the first year of the programme – Latvian residents feel a greater sense of belonging to their country and to their communities, participation and cooperation have grown. 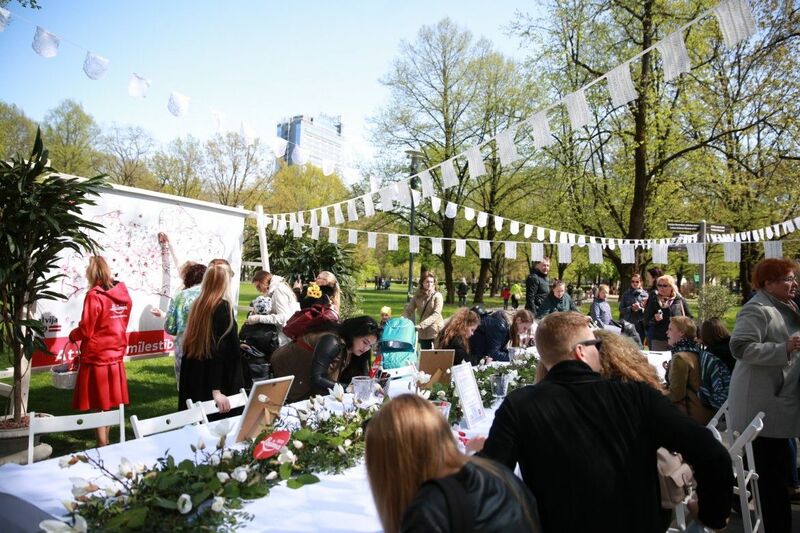 More than 500 000 Latvian residents participated in the recent celebration of the Renewal of Latvian Independence, and new initiatives from around 500 communities have been added to the programme,’ said Latvian Minister of Culture Dace Melbārde. ‘The Centenary programme has also given the impetus for many new projects of lasting value in a variety of fields. For example, the Latvian Film Industry is experiencing a renaissance through the Latvian Films for the Latvian Centenary programme. Interest in Latvian films has quadrupled, and three of the five most popular films in the theatres were made locally. The Centenary has also provided many opportunities to portray a positive image of Latvia abroad, to create new initiatives, and to develop business ideas. The exhibition of Baltic Art at the Musée d’Orsay in Paris and our participation in the London Book Fair are excellent examples of public diplomacy, but they are also an investment in the development of Latvia’s political and economic relationships. Forty works by Latvian authors have been translated into English, and 39 into a number of other languages; and the printing and publishing industry is enjoying many new opportunities for export and development,’ said the Minister. ‘The Latvian State Centenary programme, which includes many magnificent events abroad, has been launched successfully. The Ministry of Foreign Affairs sees the Centenary as a five-year event, starting with recognition of the historical events of 1917 at the Latgale Congress, the creation of the Latvian Provisional Government, and the diplomacy of the period just after Latvian Independence was declared, vital for de jure recognition of the new state by the international community and its acceptance into the community of nations,” explained Minister of Foreign Affairs Edgars Rinkēvičs. ‘The Ministry of Foreign Affairs considers the Latvian State Centenary to be an instrument of soft power that allows us to tell the story of Latvia as a part of Europe, to talk about our history, our future, and our present achievements. Collaboration with the Latvian diaspora is essential, and the Centenary programme has strengthened their cultural identity. The Centenary also provides a wonderful opportunity to facilitate political contacts. A number of high-level visits have already taken place this year and there are more to come,’ said the Minister. Latvia has 48 missions abroad, which are working on a great many projects in more than 60 countries. In 2017, the Ministry of Foreign Affairs coordinated public diplomacy programmes for the Centenary though 68 events in 25 countries. At present, 176 public diplomacy projects have been confirmed for 2018, but as many are still in the planning and confirmation stages. The Latvian diaspora are involved in a wide variety of Centenary events. This year at least 300 events have been planned, of which 60 are large-scale events. Interest in Latvian State Centenary events is high among the Latvian population. According to a study by Kantar TNS, the great majority, or 81%, of residents aged 15 to 60 are interested in participating in Centenary programmes. Recognition of the Centenary symbol is also high – 72% of Latvian residents recognise it. The public is most interested in attending events specially organised for the Centenary (53%) or in celebrating the Centenary at home with their families (43%). Young people aged 15 to 19 have shown the greatest interest and involvement in the Centenary events. Roughly nine of ten young people (91%) are ready to attend events, to celebrate with their families, and to participate or encourage others to participate. Moreover, the Centenary has motivated more than half of Latvia’s population to commit to realising a project honouring the nation’s anniversary. When asked if they had a personal project for the Centenary, 17% of respondents replied that they are planning home improvements, 14% want to make positive changes in their personal lives and health, and 11% replied that they want to learn more about Latvia and Latvian culture. People are also resolved to make career changes, begin new studies, and explore their family history (data from Baltic International Bank Latvian Barometer, November, 2017). The Latvian State Centenary has stimulated the realisation of many projects of lasting value. These are investments of time and money that will give future returns in various forms – new business ideas, technology, creative projects, etc. First and foremost this is an investment in the Latvian people of today and tomorrow, facilitating creativity and public initiatives. We will be able to see some specific results of the Centenary programme by the end of the year and over time, but we can already recognise certain fields that have prospered. The new tradition of celebrating White Tablecloth Day was created to honour the Renewal of Latvian Independence on May 4. This is an example of public engagement and the promotion of community cooperation. Although White Tablecloth Day is a new tradition, more and more people have begun to celebrate this day. In 2018 more than 500 000 people planned to mark the occasion, which is almost double the number of people who celebrated the previous year. Public opinion regarding the significance of May 4 has also changed and it is now the majority of people consider it to be among the most important national holidays. In 2015 only 2% of the population considered May 4 to be a significant holiday, but this year the number has grown to 54%. As the Centenary programme kicked off, the emphasis was on regional events, including travel and exploration of the Latvian countryside. Local businesses predict that the Centenary will have a positive effect on domestic tourism in 2018. As tourist routes develop, municipal government are collaborating more actively in the creation of interesting programmes and in developing local infrastructure. Traveling the Latvian border has become one of the most popular tourist activities, but soon new tourist routes will open – thematic routes related to the various regions of Latvia and their history, culture, and traditions. And in Latvian Cinema seven of the sixteen films included in the project Latvian Films for the Latvian Centenary have already been released, stimulating interest in local cinema. The state film distributors have compiled their statistics about ticket sales from the first three months of this year – of the five most popular films, three are the work of Latvians. The distribution system has also been improved, ensuring that each of the Centenary Films can be seen in more than 100 theatres around the country. Almost 200 000 people had been to see the films in the cinema by May 2018. The Centenary Films are also reaching a wide audience on television. For example, Varis Brasla’s film Grandpa More Dangerous than a Computer had a greater audience than any other film in the last five years – it was seen by 450 000 TV3 viewers. An excellent example of developments in literature was participation in the London Book Fair, where Latvia and Latvian authors were well represented. And thanks to marketing and the export system that has now been established, 40 works by Latvian authors will be published in English this year; this is the largest volume of literary exports from an independent Latvia. Exporting literature not only increases recognition of Latvia and Latvian authors, but the printing and publishing sector also benefits from growth, an increased number of employees, and an increase in tax revenues. More than 900 businesses operate in this sector; they employ more than 6000 people and pay 95 million EUR in value-added tax. The art exhibition Wild Souls. Symbolism in Baltic Art at the Musée d’Orsay has around 2500 visitors each day. 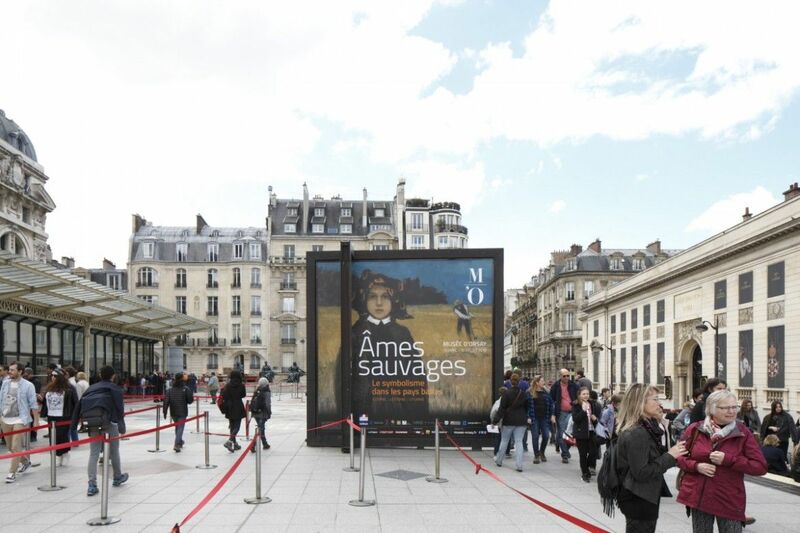 The exhibition has attracted the attention of the French media and the response from art connoisseurs has been positive. This Centenary project has also opened the way for cooperation between the Latvian National Art Museum and some of the most prestigious museums in the world. The results of one such endeavour can be seen currently at the Riga Bourse which is showing the exhibition Art Nouveau. Its Beginnings, Influences and Original Nature. It includes works on loan from the Musée d'Orsay in Paris, the Victoria and Albert Museum in London, the Sainsbury Centre for Visual Arts in Norwich, the Royal Museums of Art and History in Brussels, the Pompidou Centre, and others. Another investment with lasting value is the creation and implementation of the Latvian School Bag initiative. The Ministry of Culture has developed a cultural programme for children and young people that includes almost 2000 events. Twelve cultural curricula were developed 2017, with the support of the State Cultural Capital Fund – cinema and concert-lectures, performances, etc. Pilot performances have already been shown in the various regions around the country. Seven projects were selected during the 2018 competition and will be shown to school audiences in May. Starting in September, all students at Latvia’s professional and vocational schools will have the chance to learn about Latvia thanks to financing from the Latvian School Bag initiative. This project will continue in the coming years. Sociological research shows that a sense of belonging and a feeling social cohesion are increasingly important as the Latvian State Centenary approaches. The study also shows the willingness of members of Latvian society, particularly of young people, to be active members of their communities, to participate in Centenary events, or to create events themselves. This is in line with the overall goal of the Centenary programme – to strengthen a sense of belonging, active cooperation the will to self-determination in Latvian society through a varied programme in all sectors. At the end of 2017, this was important for 37% of the population, but this desire has increased by 15% in 2018. The studies show that, regardless of age or nationality, people in Latvia most appreciate Latvian nature, our history and cultural heritage, the regional countryside, Latvian traditions, and a clean and orderly environment. The sense of belonging felt by minorities living in Latvia has increased significantly: 84% of respondents feel closely tied or very closely tied to Latvia.In 2015 this number was 67% and in 2013 – 69%. Respondents from the older generation feel a stronger sense of belonging, however, in the past few years the sense of belonging felt by minority youth has significantly increased according to the study "The participation of minorities in democratic processes in Latvia", which was completed in April 2017. 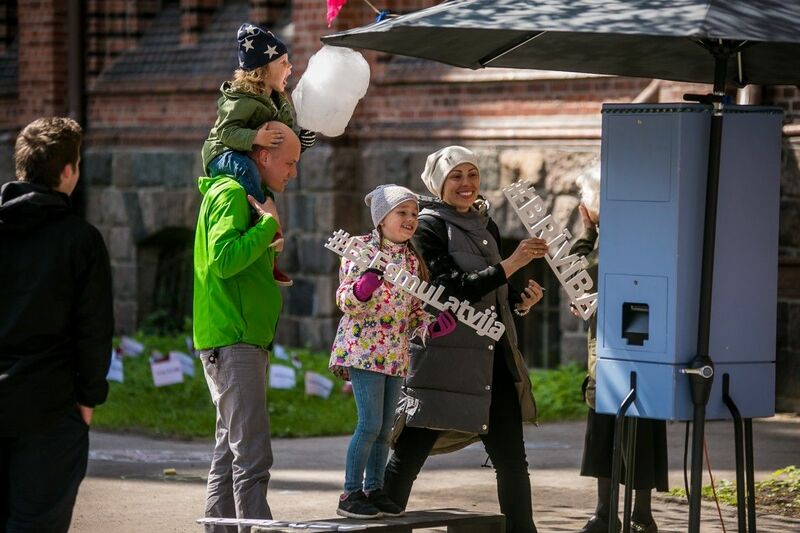 Local pride and a sense of belonging has also increased for minorities living in Latvia, particularly among Russians: this year 59% of respondents stated that they felt pride and belonging to Latvia compared with 44% in 2015. Half of the minorities living in Latvia consider themselves Latvian patriots and only 8% do not feel they belong, which demonstrates the successful integration of minorities into Latvian society.